When you are looking for a bicycle tool kit that has it all, you will definitely want to take a look at this well-respected toolkit from Park Tools. The Park Tool AK-37 Advanced Mechanic Tool Kit is the third largest kit from Park Tools and would be OK (at least as a base to build on) for the pro mechanic setting up a bike repair shop… or it would make an excellent tool kit if you have the skills and enjoy working on your own bike at home… you could think about taking a bike repair course so you can do the tool kit justice. 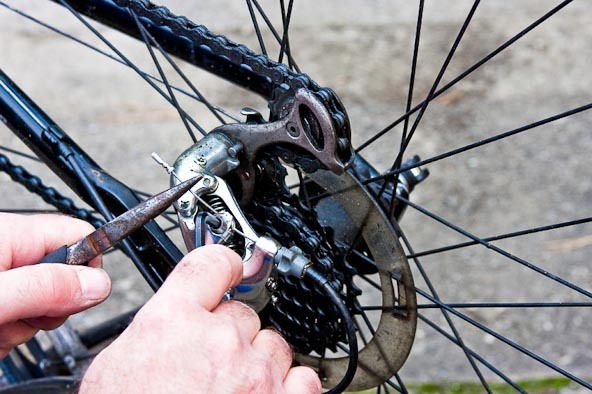 If you work on your bike at home it basically has all that DIY home mechanic needs to get into the most common bike repairs and maintenance tasks, from headset overhauls through to simple brake adjustments and chain cleans. The tools in this kit are up to date and keeping pace with the fast-changing world of bike components… so you will find they are compatible with most of the bikes currently made as well as older bikes. 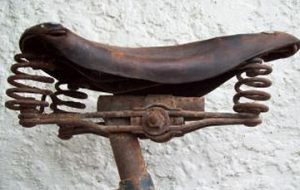 The tools that are made domestically overall have a nicer feel. With handles of tough PVC and steel that is finished with a slightly rough black finish – these tools are made to do work. One of the handy tools included in this bicycle tool kit is the chain wear indicator. It is shaped like an H and all you do is wedge it into the chain. You’ll need to replace your chain if it fits, as a stretched chain will wear the cogs a lot faster and the bike won’t shift well. This tool makes this problem very easy to diagnose. The Park Tool AK-37 Advanced Mechanic Tool Kit also comes with a chain cleaner, a box consisting of sponges and brushes. the cleaner box comes in two pieces you clip it around the chain and fill up the box with solvent, turning the cranks will clean the chain. The cleaner works well, and after a minute or so your chain will be clean. The wheels and brushes in the box have metal axles to help clean off the gunk on your bike chain. cone wrenches, which for rebuilding hubs. the cassette or chain whip tools that make it simple to change out your bike’s rear hub cogs. tire levers that are very sturdy. 9/16 and 15mm pedal wrench. tire boot and a chainring bolt wrench. It is always interesting to read the reviews from customers who have already purchased the products you are looking at… in the case of this toolkit most of the reviews are positive or just nit picking with the occasional constructive criticism I tend to focus on the constructive criticisms when looking to buy… Most found that the Park toolkit has all the tools that they need to repair or maintain a bike, and are quite pleased overall with their purchase. They like the fact that it is a set so that they have all they need in one place. Some did not think the kit as a whole as a good value, stating that they could have gotten the tools separately for a better price. It’s not easy to find the perfect bike tool kit and it is even harder for manufacturers to build a tool kit to satisfy all bike riders – We can be a tough audience ! 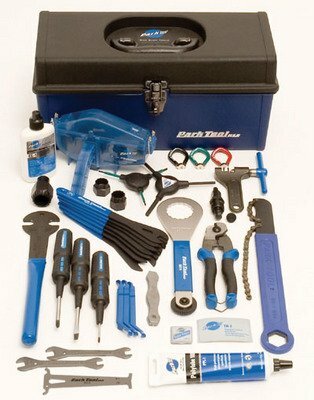 Overall, this toolkit that has some of the best bike tools you will find without spending large amounts of cash… a good indicator is those past buyers are predominantly happy with the kit as shown in the reviews, if you are looking for something of above average quality for working on your bike at home, or even starting up your own small bike repair shop, this toolkit would be a great starting point. How To Join A Bike Chain DIY Bike Repair Video’s…Online Bike Mechanic Course 5 [Free Tips] For Basic Bike Maintenance! The Quadlock Bike Mount Kit for iPhone New Mountain Bike Trails, Windrock Park in Oliver Springs. Previous Post Cycling Safety Next Post Allen Bike Racks – Allen Sports Build The Best Bike Racks Available!